Santa needs to update his game. He does the same thing every Christmas and he’s been wearing that same red suit for 100 years. And what’s with those reindeer? Sure, Rudolph is cool and all, but magical reindeer are so last century. He needs a new magical creature that can carry in through the holiday season. Do you know what mythical animal is hot these days? The unicorn. Yes, we think that instead of riding on a sleigh pulled by reindeer, Santa should be riding a magical space unicorn. We said it. But that’s only because this Tipsy Elves sweater put the idea in our head! This women’s Santa Riding Unicorn Ugly Christmas Sweater is a sight to behold. It’s not your average ugly Christmas sweater attire. No, no, no! It’s a black background with plenty of stars and planets on the front. 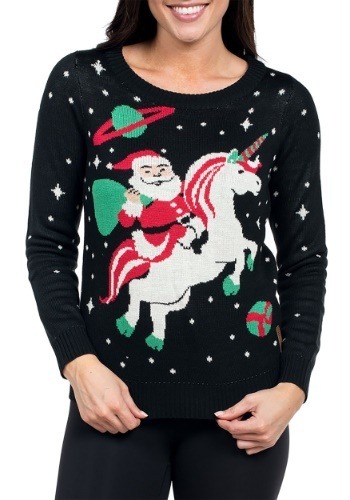 Of course, the real treat on this sweater is Santa Claus on the front… who’s riding a gosh dang unicorn! It’s a majestic Christmas miracle! Just toss this on during the holiday season to get a festive look! Maybe Santa will take notice and begin looking for a unicorn to team up with this season.